For almost as long as we’ve used mobile phones, we’ve been able to send and receive text messages, and later audio and video, through the cell network. Yet, as data packages become increasingly more common for mobile devices, sending those messages over the Internet sounds more conceivable than ever before. 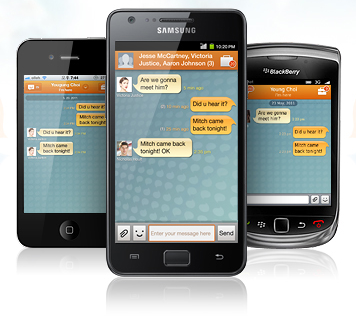 Samsung is the new player in this space with its ChatON messaging service. Other companies have developed this type of service in the past; typically, they all allow text, video and picture messaging between compatible devices. RIM offers BlackBerry Messenger and iOS 5 by Apple will include iMessage, both with similar feature sets but different interfaces. Yet, they don’t support any device made by others, making it impossible for Blackberry Messenger users to communicate with Android or iPhone users, for example. Samsung’s ChatON, on the other hand, will work with every major smartphone platform available, including iOS, Android, Blackberry OS as well as Samsung’s very own homebrew OS known as Bada. Indeed, ChatON will allow users to message each other no matter which platform they’re running, just as long as they have the client installed. As you can tell from the demo video above, Samsung is being rather serious about ChatON and has indeed packed it with features. The most basic feature is one-to-one text chat, which behaves similarly to other chat clients on both traditional and mobile platforms. Group conversations are also easy to set up, making it easy to chat with many at once, much like what’s possible with other chat clients as well. More than just text, users will also be able to share multimedia through a feature known as Trunk. For each conversation there’s a Trunk, which organizes all the multimedia sent throughout said conversation. It will even be possible to add comments to existing media, making interaction that much simpler. In addition to Trunk, ChatON will allow simple video animations to be created right from the device using hand drawings, text, backgrounds, images as well as a background music which is also available at the user’s disposal. This feature, which has no comparable equivalent on other clients, is known as AMS, which stands for Animation Message Service. ChatON will be available in September in as many as 120 countries, according to Samsung itself. While not particularly innovative, this tool might help needing users cut down their SMS fees, but keep in mind that data charges apply.